The numbers continue to change over time, but currently Louisiana snakes number close to four dozen species. It’s an average number of snake species for states along the Gulf Coast. The warm climate fits their needs perfectly. So, how does that large number of Louisiana snakes translate into New Orleans snakes. When tourists think New Orleans, they think Mardi Gras, food, jazz and other fun types of entertainment. New Orleans snakes probably don’t make the top ten list for any tourist. After all, with few exceptions such as locals wrapping snakes around their necks and walking around the French Quarters, snakes don’t receive the tourism PR that other city events receive. Many urban areas hare not hospitable to snake populations. New Orleans is a bit different than the average urban area. First, a quick glance at a map shows that New Orleans is surrounded by water and wetlands. The Mississippi River and Lake Pontchartrain are the city’s star attractions. Most visitors do not know that the Bayou Sauvage National Wildlife Refuge is also located in New Orleans, and it’s advertised as only 15 minutes from the French Quarter. While many parts of the city are snake free, areas in the city with suitable snake habitat can easily be found. That’s especially true for the local watersnake population. Any of four different species could be found along the Mississippi or in the city parks such as City Park. They are generally large and bulky snakes with patterns down their body. The top picture shows a Diamond-backed Watersnake. 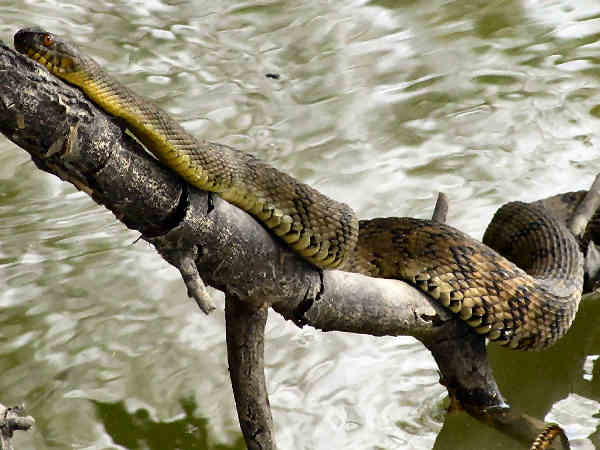 Younger watersnake species are often mistaken for one of the local venomous snakes, the cottonmouth. Canebrake Rattlesnakes (Crotalus horridus) or Timber Rattlers also make news when they are discoverd within city limits. The top picture shows a Diamond-backed Watersnake. The Brahminy blind snake is the only snake species that is definitely known to be parthenogenetic throughout its life. That is, it is an all female species that automatically begins to lay fertile eggs when it reaches sexual maturity, without the need for males. If a single individual arrives and lives, it may eventually establish a population. To date, no complete list of New Orleans snakes has been compiled. Best estimates can be deduced by looking at range maps of Louisiana snakes in general and recording the species that fall into the New Orleans grid on the map. No doubt the mud snake lives in the muddy waters of the city’s Bayous and ponds. 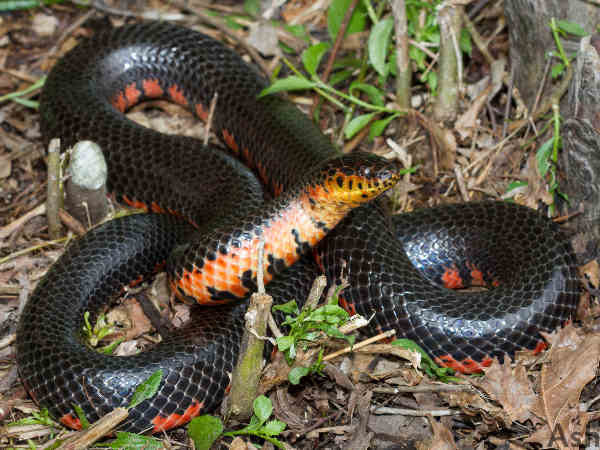 The picture shows the Mud Snake, a striking black and red colored snake. They eat water based amphibians such as sirens and salamanders. While visiting a local Bayou or swamp, also keep your eyes peeled for the Glossy Swampsnake. It does not have as striking colors as the mud snake, but the lighter belly color contrasts with the darker color on the top of the snake. Dekay’s Brownsnake (Storeria dekayi) is one of a few common eastern snake species that is adapted to urban life. 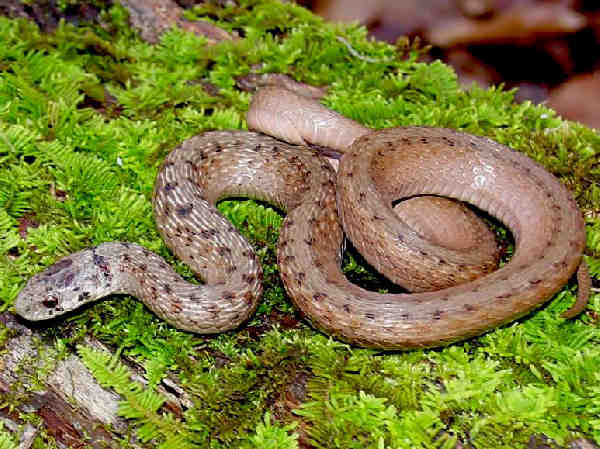 They grow to be about a foot in length and as the picture shows, the name brown snake applies to the body color. Tourists and residents need not worry crossing paths with them. All these snake species are nonvenoumous.